I used to order Pad Thai at every Thai restaurant I went to because I really love this dish. In doing so, let me tell you, I've tasted some very bad Pad Thai. Some Thai restaurants think they should alter the recipe to cater to American tastebuds so they use ketchup or peanut butter (gasp!) in the sauce. I've had my fair share of gooey noodles sitting in some very sweet bright orange sauce. For someone who's never had Pad Thai, it might not taste half bad but I know the difference. It just won't do. 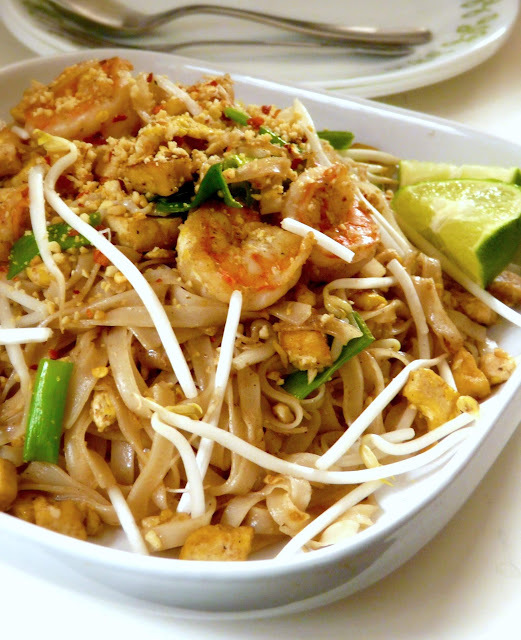 In Thailand, Pad Thai is considered to be street fare and most commonly eaten as a snack or light meal. For this reason, authentic Pad Thai doesn't usually come with alot of meat aside from a few pieces of shrimp. 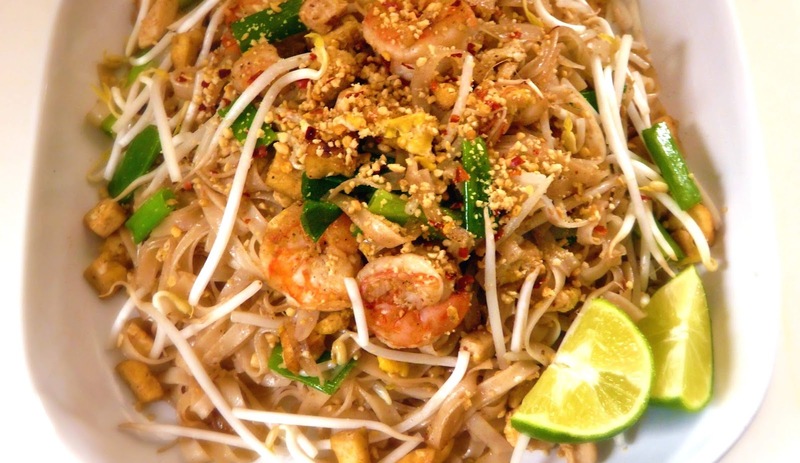 Here in the U.S., Pad Thai's eaten more as a one-dish meal, or eaten family style, along with other dishes. Since I was making it for dinner, I added chicken and shrimp to bulk up the dish but I definitely left out the ketchup or peanut butter. It's atrocity to even consider it! Pad Thai is actually very easy to make. The key to good Pad Thai is the sauce, as well as the way you stir fry the ingredients and noodles. Let's cover the sauce first. It should have a good balance of sweet, salty and sour. Spiciness is optional as that can be added on the side later on. If you're not into spicy food or feeding someone that can't take the heat, by all means, leave the spice out of it. In this recipe, fish sauce, tamarind paste, lime juice and sugar are the only ingredients that make up the sauce. That's it. If you prefer your sauce a little sweeter, add more sugar. If you like yours more sour, add more lime. 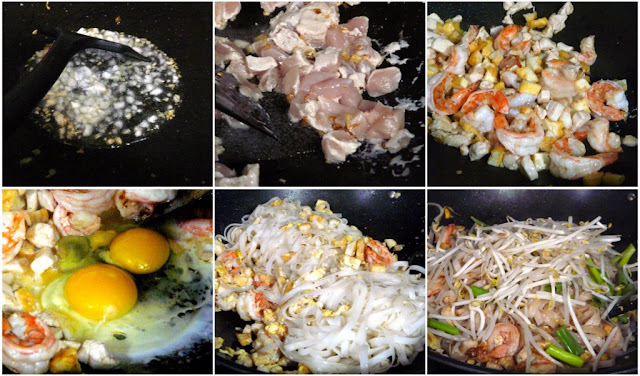 Adjust according to your taste but stick to this combo of ingredients and you've got basic Pad Thai sauce. Now let's cover the stir frying. First rule of thumb, don't overload your wok. You have to keep the heat high as you work your way through the ingredients. The idea is to cook the food quickly at a high temperature. If you're cooking more than two servings, you'll have to split them into batches. If you don't, you'll end up with soggy Pad Thai. It'll taste even worse than Pad Thai with ketchup and peanut butter. Not recommended! You need to first soak the rice sticks in water for at least an hour. 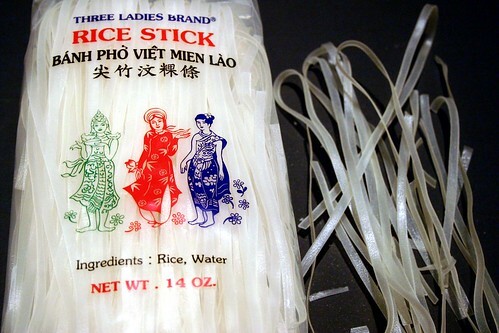 Rice sticks are dried rice noodles found in the noodle aisle at Asian grocery stores. You want to buy the ones that are shaped like skinny fettuccine noodles as they come in a variety of widths. I forgot to snap a photo of the noodles in its dried form but here's one for reference. If you can't buy it at the store, you can easily buy it online. After the noodles have soaked for an hour or more, drain them well and set aside. 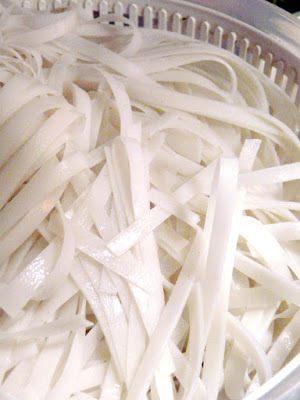 Noodles that have been soaked and drained. They should be softened and pliable but still a little firm. If you're using tamarind paste straight from a bottle, you can skip this step. But if, like me, you're using a hardened block of tamarind, you'll need to mix 1/2 cup of it with 1/2 cup of warm water. Set aside to allow the tamarind to soften and break down. After about 30 minutes, massage the tamarind in the water with clean hands until it breaks apart. You'll end up with a chunky brown mixture. Strain the mixture by continuing to massage and mash it with your hands in the sieve. Scrape off the bottom of the sieve and discard the tamarind pulp. You should get about a half cup of the tamarind paste which will be a little on the watery side. Tamarind "cake" in its packaging, softened tamarind with seeds and draining in a sieve. It's important to make the sauce ahead of time so that you can adjust it to your taste and get the right balance of flavors beforehand, rather than by adding the ingredients one by one during the cooking process. To do this, whisk the tamarind paste, lime juice, sugar and fish sauce together in a bowl and set aside. Pad Thai sauce: Mixed and ready to use. Note: You will end up having more sauce than you will actually use. The remaining sauce can be stored in the fridge for a future Pad Thai craving. It's always better to have more sauce than not having enough, don't you think? While the noodles are soaking, cut up all the other ingredients. 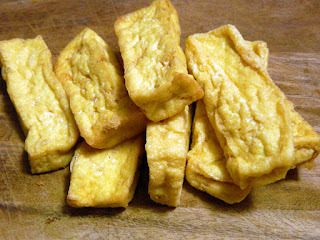 I used fried tofu but you can also use the hard, baked variety. If neither of these are available, you can substitute with firm or extra firm tofu. These should be available in most American grocery stores. Just be sure to drain and dry the tofu very well. Dice the tofu, shell and devein the shrimp and cut the chicken into bite size pieces. Heat the 1/4 cup of oil in a wok on high heat and quickly saute the garlic until fragrant. Add the chicken and continue to stir fry for about a minute. Then add the tofu followed by the shrimp. Stir fry for another 1 to 2 minutes until the shrimp is almost cooked. Push the ingredients to one side of the wok and crack two eggs into the middle of the pan. Let the eggs set a little before breaking them up and scrambling them. Add the noodles into the wok and fold them into the eggs and the other ingredients. Keep folding the noodles over a few times. Add 1/2 cup of the sauce mixture to the wok and continue stir frying for another couple of minutes. The noodles will have softened at this point. If you find that the noodles are a little too dry, add a little more sauce. Next, add 1/2 of the ground peanuts, 1 cup of the bean sprouts and all of the chopped green onions to the wok. Stir fry for half a minute then remove from heat. Transfer to a large dish and top with the remaining raw bean spouts, peanuts and chili (if using). Serve hot with a couple wedges of lime. Yesterday, my husband showed me this article and he wants me to cook this yummy Recipes For Stir Fry. I brought all the ingredients given here and I will cook this one today. I will share this to my friends and I'm sure they will like this very much. Thank you for sharing this with us.